My friend Peter’s description of his encounter with himself while quail hunting is an experience many hunters might find familiar (despite its strangeness). I like his description a lot because it somehow holds “in place” the feeling of finding yourself after losing yourself (which I mentioned in my previous post) in the field. I think that finding is predicated on losing, even if you don’t realize you’ve lost something. 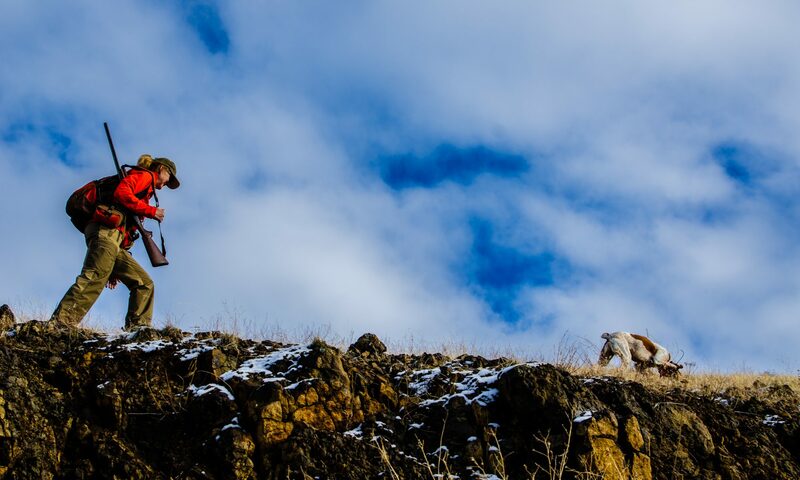 It’s a reminder that’s there for you if you care to notice, which sometimes might be interrupted by another wave of chukar busting. And the thing that’s there to notice might or might not be remarkable. It’s just there. What do you do with this? For me, it’s probably the best explanation of why I hunt, and maybe the best reason I can come up with for why I continue to want to live. There are other activities which corral this type of losing-finding; playing music, for me, is one. I think there’s a kind of addictiveness to these things, an incentive. The off-season is hard on many hunters because there’s no substitute. We think we might be able to recapture it by reading, looking at photos, shopping for gear, working with our dogs, shooting clays, even hiking in the spring to see how many birds made it through the winter. It’s not there, and there’s a lurking sense of dissatisfaction that pervades these surrogate things. At this point in the season I find myself less and less able to fend off the regret of the impending “off-season.” I’m finding myself a bit off. But not entirely. On Christmas Day, we tried to hunt chukar but it was dumping snow and very windy, and we just didn’t feel like battling the weather, which didn’t look as if it was going to let up. So we drove home and joined our neighbors across the way who were breaking in their new electronic clay pigeon thrower (awesome gizmo!). Leslie, who’d been feeling less confident in the field because she’d missed some shots at birds and because we hadn’t practiced, absolutely crushed the targets. Confidence regained. I, on the other hand, could not hit anything. I didn’t know what my eyes were seeing, what to do with the barrel, which acted like the target had been granted a restraining order against it. I was lost (I was not hunting?). The next day, in the field, on some tough shots at fleeing chukar, I didn’t miss. I don’t know why, except to say that shooting targets and shooting chukar are two completely different things. Out there, I’d found what I’d lost on Christmas Day. I was on, I’d found my shot. Maybe it’s because I wasn’t thinking; I was doing hunting, which requires a certain kind of mindlessness. Or maybe it was just luck. Many thanks for a season of interesting tales and thoughts on chukar in particular and bird hunting in general. A colleague & I acquired a couple of your hats a few months back, and we initially wondered whether they conveyed an uncanny ability to reduce the birds to possession. After a rather humbling day over the weekend in high winds, I have to conclude perhaps not, but they were a nice addition to the ragtag assembly of torn & worn gear that constitutes a chukar hunter’s wardrobe. Winter well, and I look forward to new stories and images until next September arrives. Thanks, Michael. Maybe I should add a disclaimer to the hats, using your eloquent description of their inconsequentialness. And thanks for reading. I’m feeling guilty for not writing more this season. There’s some stuff pent up, so more is coming. Best wishes for the long off-season.